As we age, our skin regenerating process slows down and that is where a professional medical facial comes in handy. A couple of weeks ago I finally had a HydraFacial ( non-invasive rejuvenating & resurfacing treatment for your face & neck ) at Waterhouse Young Clinic, having heard a few of my girlfriends rave about it in the last few months (particularly in the run up to Christmas). It is a type of treatment that merges spa approach to a facial with advanced medical technology and helps you to achieve more effective overall result by actively rejuvenating the skin. I was met by the clinic’s medical doctor Michele ( Mica ) Engle who was born and raised in Brazil ( Brazil is known for its beach culture, when one looks perfectly tanned, fit and comfortable in their own skin. It is also famous for its amazing plastic surgeons, who create pioneering techniques and lead many advances in the field). Michele is the clinic’s aesthetic doctor and she is the person who does Visia Skin Analysis & consultation prior to your facial. Mica’s background is in general medicine, as after graduation she worked as a GP, as well as in the A& E. She studied preventative medicine in Italy and has now build up her name in the cosmetic medicine in London, where she has been based since 2007. To start with, Mica went through a medical questionnaire with me, asking whether I had any medical procedures or conditions. She also enquired about my skin concerns and what I wanted to achieve. My word of the day was ‘radiance’ – whether you are a beautiful 20 year-old colt or a ravishing 50 year-old woman, we all want a radiant glow and clear skin, a sign of health & balance in our life. Visia skin analysis allows the doctor to access your skin in-depth and tailor make the treatment, according to your needs. The machine takes magnified 3-dimensional images of the various areas of your face-you are asked to close your eyes, while three pictures are taken of your face and transferred automatically to the computer, where your data is compared to a group of people of the same age, gender and skin type. Some of the images look ok ( images are stored on the system, so if you come back in the future for another treatment/s, you results can be compared & progress examined ) but some look like you have aged a decade or two in the course of a single camera click-a bit disconcerning but it does give you a fairly accurate picture of your skin and allows the doctor not to just access the surface of your skin but see the layers underneath. This allows the doctor to recommend some preventative measures for you, which you can incorporate into your daily skincare routine at home. The skin analysis system will analyse such skin issues as wrinkles, pores, texture, bacteria, sun damage, brown spots and redness areas and highlight the problem you might already have. Then Mica combines the information from your questionnaire, your voiced concerns and the Visia skin analysis results before you go in to have a facial ( mine was done by the lovely Anna, WY clinic director ). In my case the area of redness in my cheeks needed to be addressed ( on the image it looked as red underneath as did my lips-normal for the lips, not so great with inflammation in the cheeks, but easily resolved with appropriate course of treatment – Mica prescribed a six week course of Rozex (metronidazole) gel ). During the facial a series of HydroPeel tips are used, each with multiple edges that will help exfoliate your skin more effectively than a home scrub. The tips have a spiral design that creates a vortex effect that dislodges and removes impurities, while introducing hydrating skin solutions and antioxidants into your skin. To start with Anna manually cleansed my face ( she made me giggle by wearing latex gloves, making me comment that my face wasn’t THAT dirty ). Then Anna turned the HydraFacial machine on & started exfoliating my skin with a non-acid exfoliant Glucosamine HCL. The tip itself felt like a gentle sucking sensation, which Anna counteracted with soothing hand strokes which followed the tip. Your whole face and neckline get treated and each area gets treated several times. A calming Laminaria Digitata Extract, firming line-soothing Yeast extract and exfoliating AHA Lactic acid, as well as buffered AHA Sodium lactate were infused through the machine into my skin as well at that stage. The impurities were sucked out and my skin was ready for Stage 2, the Extraction. In my case Salicylic acid was used in the infusion –it helps to even out skin tone, kills bacteria, softens sebum & helps to reduce pore size, if that is one of your concerns. This process of microdermabrasion ( where unlike in a regular one, no crystals are used ) feels somewhat gentle, even though the actual sensation that you experience can be compared to someone sliding sandpaper feather over you skin. Before long Stage 3 was upon me, an acid peel. Peels can be gentle or harsh and even though they are effective, if used correctly, I don’t have them often. Glycolic Acid (7.5%) and salicylic acid were combined within the machine and applied to my skin with the main aim here was to stimulate fibroblasts that produce collagen and elastin, as well as reduction of sun damage and pigmentation ( I don’t have much pigmentation but do spent time on the beach every year, though I am meticulous about wearing the sun-protection and become even more so as I get older ). If you think about the many times I have used the word exfoliation here, it might be concerning but actually, as it is a medical facial and it is closely controlled and monitored ( every treatment at Waterhouse Young clinic has been tried by their staff, so they can guide you not with just the words, but with their own actual experience ). Stage 4 of the treatment, Hydration was achieved by combining Hyaluronic Acid ( known for is hydrating and plumping qualities ), White tea ( calms and soothes the skin ), Horse chesnut ( good for moisturising & sometimes is beneficial to eczema sufferers) and Vitamins A, E and Rosemary, known for their antioxidant properties. This stage feels not just relaxing but deeply soothing, so you can drift off into a comfortable slumber. Now, to the wonderful Stage 5, which in my case combined LED Red ( a gentle & effective treatment that is becoming more and more popular in skin clinics because of its healing and rejuvenating effect on the skin matrix as well as the plumping effect ) Blue light therapy ( great for acne prone skin, as well as helping clear bacterial growth & skin blemishes ). When Anna put two little red light pads on my face they felt like cool marble pebbles, easily gliding over my face. Red light treatment last for a total of twelve minutes, before it was followed by a shorter session of blue light. By that stage not just my face felt relaxed and soothed but my mind as well. The facial is completed by the application of the appropriate serum and moisturiser, with the whole process taking up to one hour, which just zooms by. I left the room feeling relaxed and even though Anna said that my face can look a little warm and flushed for about up to an hour, in actual fact it looked rosy and somewhat plumper. My skin felt so lovely I couldn’t be bothered to apply concealer & tinted moisturiser ( which I generally would do post-facial, with one of the reasons being SPF protection of my ‘renewed’ skin ) on this occasion and in actual fact I was told by several women that day how glowy, rosy-cheeked and defined my face looked. I even took an unprecedented step of taking a Twitter selfie in order to show the result of this facial treatment. So if you want to know what state your skin is truly in, as well as address some pre-existing concerns, this is the facial to have. It will renew your skin, plum and moisturise it and give you a direction to follow when it comes to skincare ( I can’t recommend Heal Gel Intensive Serum high enough-just one of the ranges sold at the clinic, with this particular one has been developed with the help of Norman Waterhouse, as part of the group of doctors who specialise in plastic surgery). 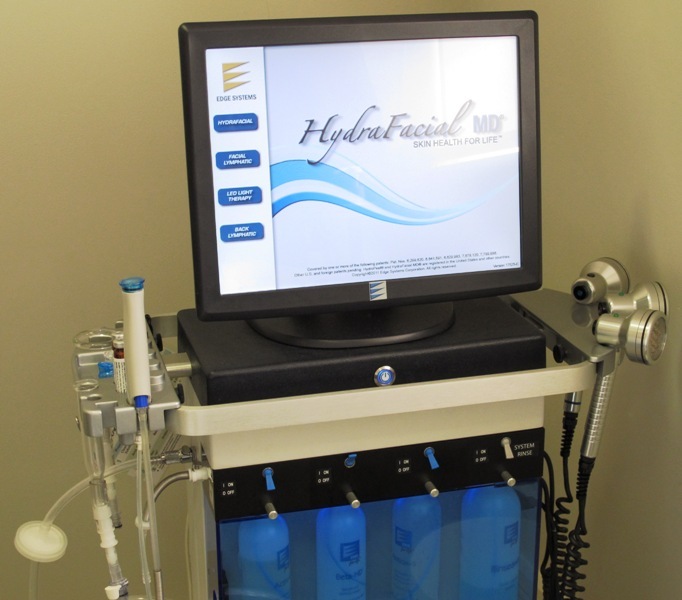 HydraFacial costs £230, call Waterhouse Young Clinic on 020 7486 3849 to book or for more information go to their website here For an intensive course the clinic recommends having one treatment a week for six consecutive weeks.